Sometimes, a trend comes along that’s a straightforward counter to the current zeitgeist, here to thrust a great big dollop of unbridled joy into our lives, and Happy Design, as I’m calling it, is just that, one of the fun ones, the quick update and buy-new-accessories ones. And yet it’s absolutely in step with what’s come before. In other words it is no oddity, it’s predictable, following on from the rise and return of gold (brighter, louder, look-at-me), and being a grand coda confirmation of the rejection of black (see my Spring/Summer 2018 Trend Report. PS Inevitably this means that black will slowly start to creep back in, such is the way of trends ie once you’ve reached an extreme, the only way forward is back to centre. Musing that the same could be said of politics…?). But back to Happy… As I introduced in my Milan 2018 Trend Report, this represents a sense of really throwing designerly caution to the wind. In an almost complete volte face to the New Neutrals, there’s a move to take those gentle retro colours and to seriously brighten, heighten and vibrantly mix and mismatch them in a very jolly and upbeat way. To note, to my eye, the ‘Happy’ palette is still somewhat old-fashioned (burgundy, mustard, peachy pinks and turquoises etc), each hue has simply had a massive shot of intensity to render it out, loud and proud rather than soothing per se. In terms of why it’s happening, it is quite simply a direct reaction to the fact that, economically and politically, it’s all going a bit bonkers out there, thus for most of us, the only correct response is to go home, shut the door, and try to leave it all behind. In short, when the world is going to hell in a hand cart, decoratively speaking, it’s time to live for the moment and do as you damn well please indoors — essentially aiming to evoke as exotic a sense of elsewhere as possible. The absolutely stunning ‘Portovenere’ wallpaper from Osborne & Little. I could gaze upon this for hours! 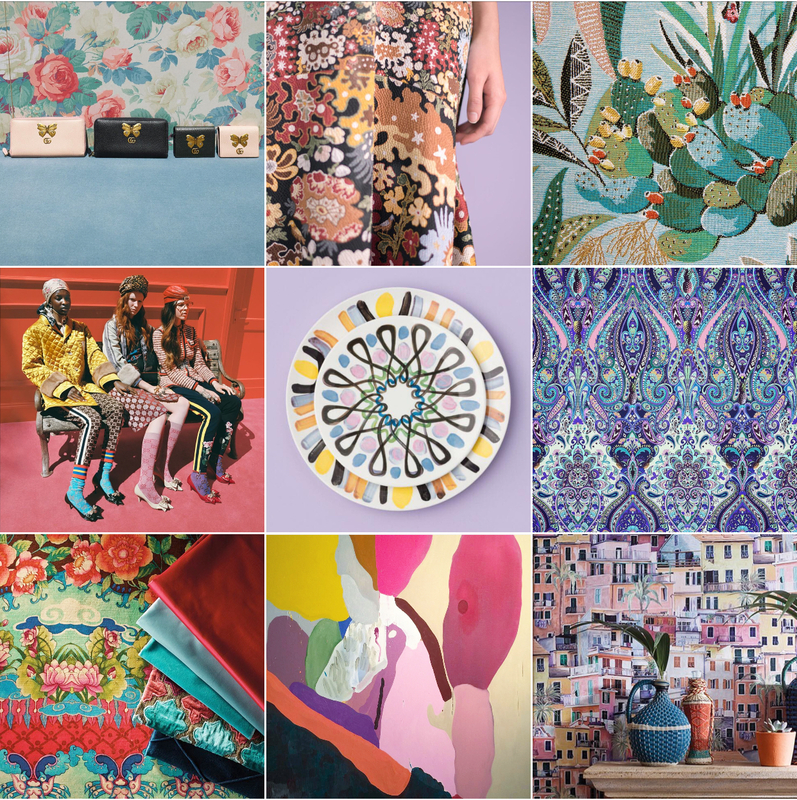 Happy Design: @michelleogundehin Instagram moodboard featuring images from Gucci, Peter Pilotto, Lelievre, Matthew Williamson, Osborne & Little and artist Les Rogers. It’s a statement too that the style pendulum has swung as far as it can go from the bland do-it-up-to-sell mentality of latter years towards a deeply personal style of home-making that’s not been seen in a while. And this can only be a good thing because what we surround ourselves with on a daily basis has the power to change our moods, for better or worse. It’s time we started making houses into homes for ourselves, now, not some idealised/stylised version of ourselves, later. 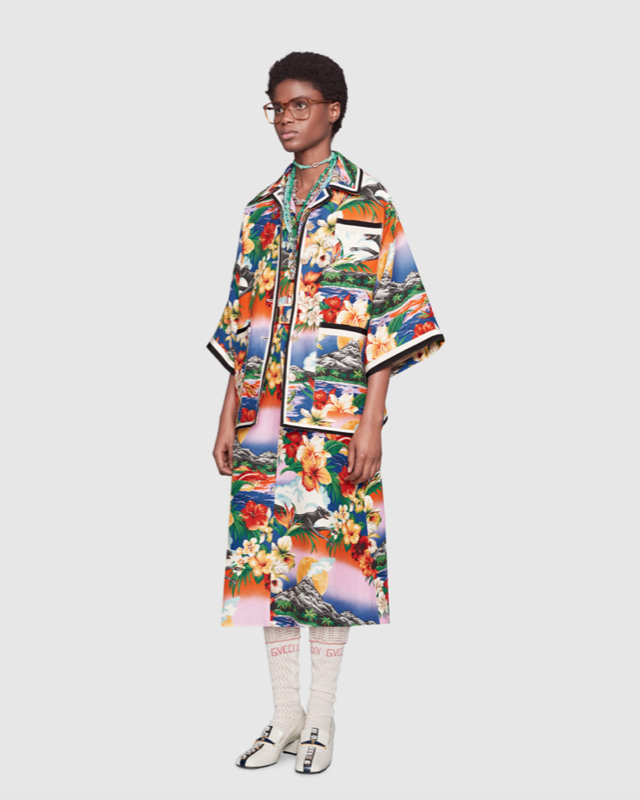 What’s especially intriguing to me though, is that for once, this ‘homes look’ is happening in fashion too. 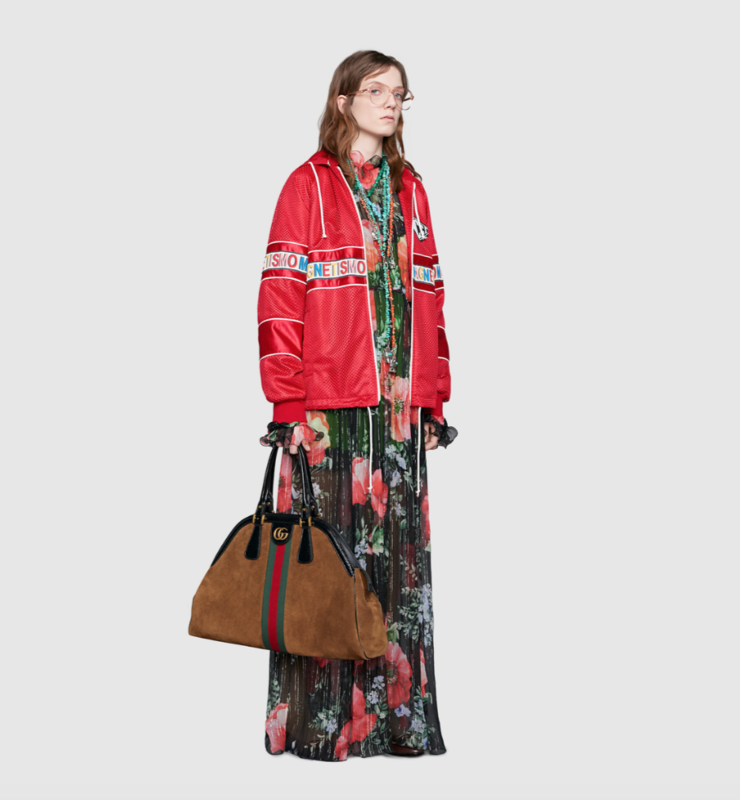 Style mavens talk breathlessly of ‘colour blocking’ and ‘technicolour dream seasons’ courtesy of new labels such as Sies Marjan, by Dutch designer Sander Lak, and even established brands like Gucci, have frankly gone a bit 1970s meets God-knows-what nuts for Spring Summer 2018 (see below). That said, it’s striking a courageous note on the catwalk, again a reflection, or rather reaction, to the fact that things are really a bit bleak beyond the comfort of creative confines. But then we are in the midst of a plethora of active rebellions: whether #MeToo campaigning, fighting for equal pay, voting to repeal Ireland’s eighth amendment or protesting against the free availability of guns in America. It’s all related. It’s all saying I-am-an-individual and I will be heard. For too long perhaps we’ve been quietly getting on with our own thing, believing our politicians and those in positions of power had it covered, but they hadn’t, they needed our help, and our very reticence to get involved has unfortunately allowed negativity to prevail. Brexit and Trump both being, in my opinion, what happens when we don’t look out for everyone; people got left behind and they got angry, so when they were given an opportunity to shout, they did so, and loudly. But nothing good comes from anger. Nevertheless, what we are seeing now, people power, means we shall prevail, for light always counters dark in the end. And from a design point of view, while it’s all a bit full volume at the moment, it will settle down. As confidence rises, there’ll be no need to shout, and this full-fat version will gradually give way to something a touch more subdued, one less print per palette perhaps. And the great thing is, we’ll move forward with less fear of colour and pattern than ever before, and thus more enthusiasm to employ it to cheer and enliven. 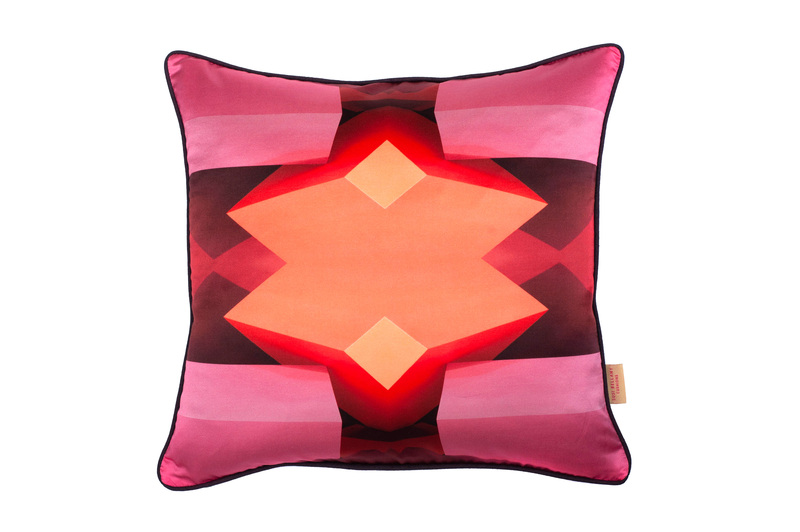 All hail the new Happy Design, whether for our wardrobes or homes, it’s a bit of all bright, for now. The ‘Lloyd’ lambswool throws, £285. Available in several other colour ways. Wallace + Sewell. 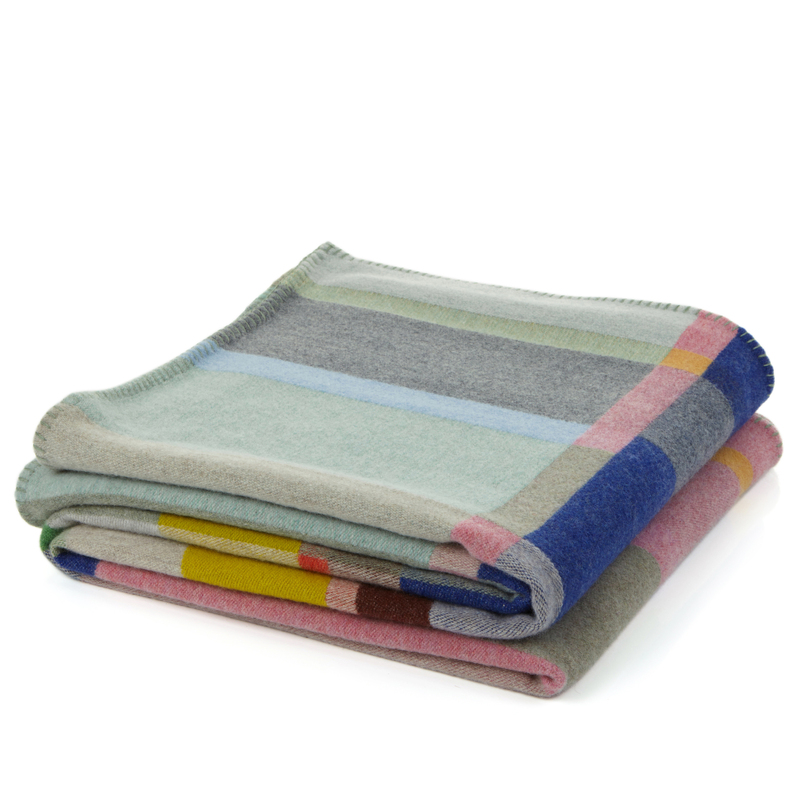 ‘Lloyd’ lambswool throw by Wallace + Sewell, £285. A real keeper buy. 3. 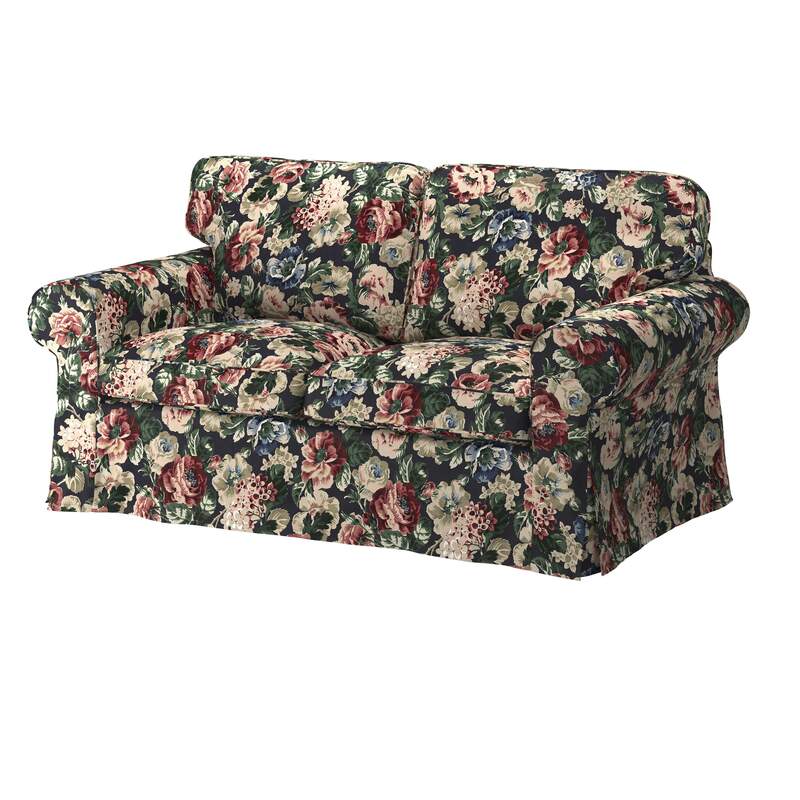 The ‘Ektorop’ sofa, new for Autumn Winter 18 from IKEA, yes really! Price yet to be confirmed.